The UK winter grinds on and post the Christmas and New Year break I was feeling a bad case of ‘cabin fever’ coming on – I needed to get out and about and get some exercise and fresh air. I’d planned a walk with my pal and as the weather forecast looked a little problematic for driving the car out to a nice rural spot we decided upon a local walk at lovely Bestwood Country Park, nearby. We met in a thick flurry of snow at a mutually convenient spot and walked over the old coal miners route, Colliers Path, picking our way along the snaking trail into a winter wonderland. It’s a beautiful spot at any old time but draped in a coating of fresh snow it appeared particularly appealing. We reached the old village and it was time for a little ‘soul food’ (actually a bag of mixed sweeties from the little shop there). The Mill Lake with it’s numerous wildfowl had never looked prettier. Passing over the rim of the cavernous old sand quarry, it was a slip-slide down into Crimea Wood – a favourite chestnut collecting destination in the Autumn. Today’s walk had one final twist though as we peered down from the muffled woodland and into the open fields of a smallholding on Goosedale. Walking and running through this area for many years, I’m used to some slightly unusual creatures being kept in these fields, unusual fowl, fancy chickens and the like but what was scuttling about in the snowy field below us warranted further investigation. 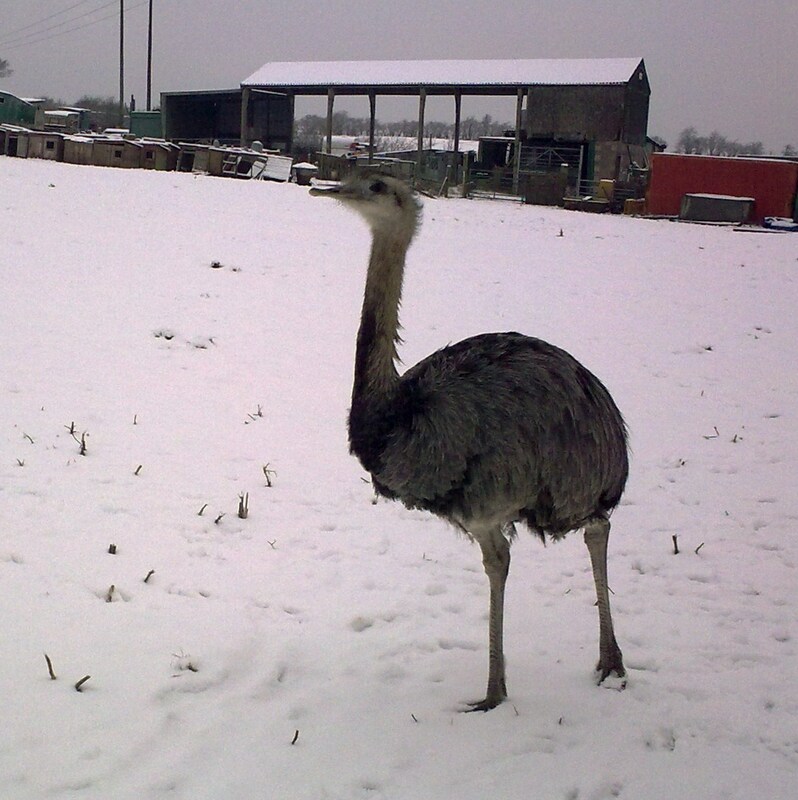 It was in fact, an Emu! 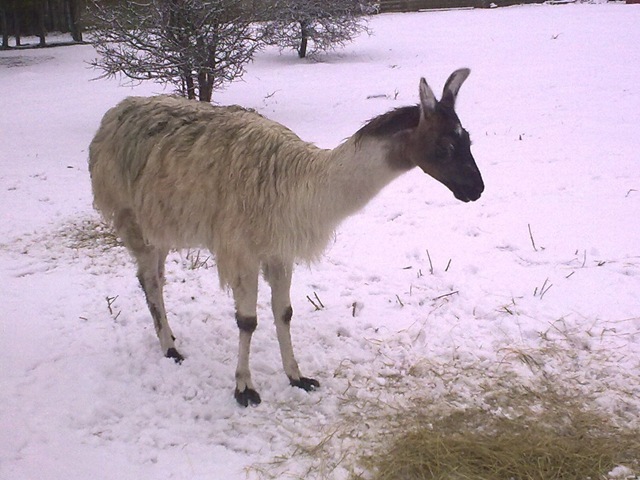 To season what was a slightly surreal situation, two Llamas poked their noses at us inquisitively in an adjoining field too. The trudge back along the thin, white Lammins Lane, back to civilisation was a toasty one as we were well dressed for the weather. A good few miles walking in the snow had earned us a couple of pints in the Lakeside restaurant on the main Mansfield Road bordering the country park. 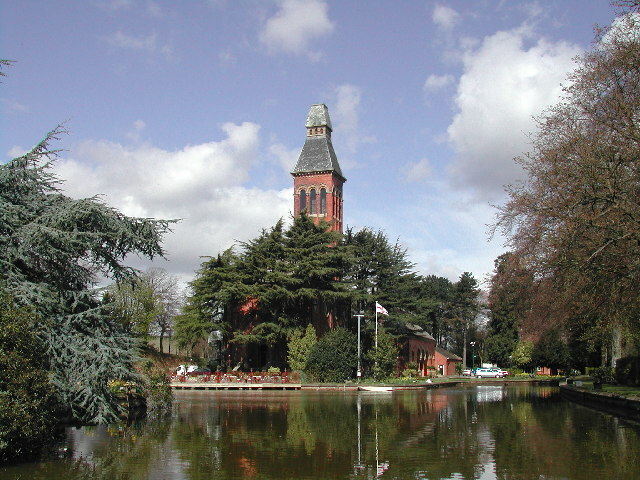 Lakeside was formerly a Victorian water pumping station and is now impressively refurbished into a restaurant, bar and health club. It’s a far cry from the days when the only inhabitants were pigeons as the grand old building lay empty for many years. It’s good to see that the typically ornate Victorian fittings such as beautiful wrought ironwork and stain glass have been retained and give the building a bearing and charm. January drags on and many people are experiencing the difficulties that a genuine winter can bring. It should equally be remembered that this time of year – particularly when we experience snow – can also be a joy in the sights it beholds for us.